BirdDogHR works with all companies but with a focus on construction, engineering and supply with employee sizes of 100-10,000 employees. Comments: Great overall system. Meets all of the Government contracting requirements. BirdDog actually pushes out updates to ensure we are compliant. Great people, great product. Customizable system is great, and allows us to use their system in different ways than initially intended. Cons: There very little documentation, because of how customizable the system is, however, Customer Service will gladly walk you through any issues. Pros: I like the ease of the system, structure and use of the options. The options to run reports are great, the capabilities this software has to accommodate working with the construction industry is very helpful and convenient. Cons: There has been some issues with returning back to the same page and at same state with back arrow option.. it appears everything is lost and you have to start you progress all over.. from setting up a search list or even just opening up a job list and specific employee, once you hit that back arrow you return back to the starting your process over again. ugh I also would like see the option to share applications with other entities within our company. Pros: It's easy to navigate throughout the site and it's well organized. The tools are very useful and user friendly. Cons: We've had a problem with applicants that apply through Indeed Mobile; their resumes and attachments are not always coming through. If it wasn't a known fact, then some applicants would be overlooked because they "didn't" attach their resume. However, I contact each applicant that has experience for the position they're applying for and ask them to email it to me. Then, once I get their email, I upload it for them. Doing this takes too much time; I've reported it to our account managers and they tell me its a Indeed thing. Pros: Once the decision was made to purchase the ATS module we were up and running very quickly. Our contact helped set up our first job posting and walked us through various options--customer support was great. They still check in to see how we are doing and what they can do for us. Our job postings look neat and professional. Links all worked perfectly . Cons: Would like more flexibility for our landing page for ATS. Some choices in layout or background and imbedded links or photographs or video. I'm not sure how effective the upgrades for various job boards is for us. Posting with colleges through Handshake would be nice. Pros: We are a uniquely diverse company (multiple business lines) from a business and industry standpoint. My role requires a constant change of focus when discussing employment and manpower from one industry/business to another. I have been able to create accounts for individual business lines to streamline communication, advertising, and process management for each company's recruiting and onboarding efforts. Cons: The internal database search could be stronger. A keyword or Boolean search would be an amazing integration. Currently, you need to tag an applicant immediately with key identifiers (ie. Department name, position title, etc) or else they can easily be lost within shuffle of thousands of applicants. Pros: Ability for front line managers to have access and view candidates that apply. Cons: some managers don't have time to filter thru the candidates on a daily basis and requires HR/recruiters to do the heavy lifting in filtering for experienced candidates. Overall: Allowed our organization to provide front line management with acces to review candidates on daily basis. Comments: I've never used BirdDog HR until my company decided to try it out. Initially, it was hard for me to adapt. I was able to get in contact with a team member and after receiving training on the systems capabilities and options, it had a lot offer and was pleased. Pros: It is easy to understand how the system works. Cons: System is slow and times out quickly. I don't like how when I want to filter through, I don't have the option to filter open, closed or all requisitions. We appreciate your feedback and customer satisfaction is very important to us. We¿re actively looking into why the system may be acting slow for you, that is very concerning to us. For the time stamp, there are many areas in the system that add a time stamp, we¿d like to better understand which area you¿re referring to. Your account manager will reach out to learn more about your needs. Comments: Look at other options. There are so many out there, many that are more integrated with an HRMS and that have responsive customer service. Consider your candidate experience as well and you'll find a better solution. Pros: *It's geared to my industry (Construction). *It's also used by several others in my industry which can help people in our industry find postings for open jobs. *They also manage some of the free boards that are specific to the construction industry. *The system does make it easy for multiple people to be informed when an application is completed. Cons: *The user experience leaves a great deal to be desired. Both for applicants and recruiters. When I used this system, I often wondered how many people abandoned the application mid-way through the process. (I was hired using this system and I was certainly not impressed by the ATS.) *The system is not very intuitive. *The system tries to rate candidates for you but we found the criteria used to be very poor. The 5-star applicants were often very poor candidates and the low scoring candidates were often a better fit. *Emails informing you of new applications are sent only once per day rather than as they happen. *When there were concerns, customer service rarely had solutions. They are not terribly responsive (except in the last few days before your contract is up for renewal). As a former customer we will take your feedback and perceptions under careful consideration. These concerns are very easily addressed and resolved by open communication with customer care and configuration changes to the system. We feel we endeavored to help you and meet your needs. We appreciated our multi-year business relationship with Story Construction. Pros: Having new employees fill out their required documents through BirddogHR software ensures me they will be filled out correctly without missing important signature blocks, etc. Cons: I would like to see the application and onboarding portals work with each other more seamlessly. I find I have to jump from one to the other too often and wished it could all be done from one site. Pros: Ease of use, ability to format and customize for my specific needs, outstanding customer support and constant updates based on customer feedback. Cons: I don't have any true complaints. A few processes feel a bit cumbersome and could be made more streamlined. I would like to see an app rolled out in the near future, as it is not always the easiest to do tasks within the system from a mobile device. Overall: This software greatly improved the efficiency of our Recruitment and Onboarding processes, allowed a more universal experience among our multiple divisions. 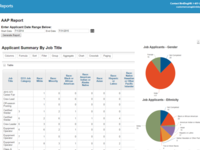 Improved organization, follow through and communication between candidates and hiring managers. Effective organization to potential and contracted employees. Pros: What I like about BirdDogHR is offering me a variety of features and services to streamline the tracking of applicants and monitoring performance, and foster collaboration and participation of employees. Cons: The downside of this software is that it does not include the module where you can plan an employee compensation. Overall: With this system I have automated every step of the life cycle of employees with the ease of which is an integrated, cloud-based system. BirdDog HR was very easy to work with and they listened to us on developing the ease of use for us. Pros: The customer service and training have been fantastic. We can go back to our trainers whenever needed to clarify information or to ask for additional help. They are very willing to work with us and meet our needs as a Company. Cons: One item I would say is a Con, is the system is not fully programmable to how we would exactly like it. However, our customer service reps have been great in showing us alternatives. Pros: Very intuitive ATS that allows me to post to multiple job boards at once. Cons: I primarily use the Applicant Tracking System, so I'm not familiar with the functions. Overall: I'm getting qualified applicants for all of my jobs. BirdDogHR makes me look good! Thank you for taking the time to leave BirdDogHR a review. We are so happy to hear that you are having a great experience with the BirdDogHR ATS. We appreciate your business and look forward to more success to come! Works in some aspects, definitely not in others. 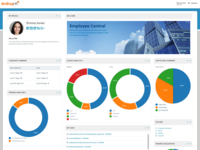 Comments: We purchased the ATS, Onboarding and Talent Management modules within BirdDog. One of my biggest concerns when shopping around was trying to find a product that we could use from the time of application through review periods without a lot of extra work. Our salesman, Sean assured us that these products would work together. Upon implementation we discovered that these products in fact DO NOT speak to one another. 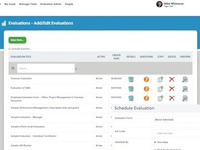 The talent management module is essentially a completely different product. You have to enter information separately in order to add an employee to this system. And on top of that, it has way to many functions for which to choose from. If I simply want to send an evaluation I have to click through a million boxes. It's probably easier for me to take the time to email someone an evaluation then it is to click through the options. I appreciate that they were trying to be thorough, but something user friendly was more of what we were looking for. We also had trouble with the functionality in the onboarding piece. I find it frustrating that after an employee submits their paperwork, they have no access in coming back to make a change. We are a company trying to be as green as possible. When I asked what an employee should do if they need to change their w-4 deductions or direct deposit information, I was informed that we would need to print the document in order to submit it to our payroll department. This is defeating the very purpose of implementing the program. This was supposed to eliminate the need for extra paperwork. Other snags we have run into involve the reporting features within the ATS. They do not always populate after you have entered dates. We have also run into issues with scheduling. The system has sent out wrong dates and times for different interviews causing major confusion and scrambling on our end when a candidate shows up unexpectedly. We loved our implementation specialist, My rep, but are very disappointed in our salesman. There are functions we have enjoyed, but this may not be the system we were looking for. We appreciate your feedback about our product, service and personnel. Customer satisfaction is very important to us therefore your concerns have been escalated to multiple VPs. We¿ve also reached out to schedule a call with your team so we can put a plan in place to improve your experience. Pros: Excellent Customer Service - Any time we need assistance, our Account Manager is quick to respond with a helpful answer. User Friendly - The system is very easy to navigate, of course there was a learning curve, primarily because it was our first ATS. Customizable - The more we use the ATS, the more we make it our own; emails, logos, job posting, sort and search functions, etc. Pros: Affordable and pretty easy to use. The ATS is a good product that is affordable and helps us source more easily especially for young professionals. Cons: Challenging to get change to occur at times and slow development. Software at this point is still a little clunky to navigate because of the navigation between the multiple modules as it is currently designed. BDHR has a plan to clean this up, looking forward to it. Thanks for the review. Your input continues to be very important to us. The product team is prioritizing your feedback. BirdDog HR is terrific, functional, easy to use! Pros: Very easy to maneuver around in system. Makes sense, logical! We used to use BirdDog exclusively, very successfully. A corporate decision to move to ADP prompted changes, but we still use BirdDog as our main function of BLASTING job postings out there!!! Works GREAT!! Oh and Customer Service is AWESOME!!!! Pros: The software has made marketing our agency much more effective from a recruiting perspective. The experience of the recruiter, hiring managers and most importantly, the candidates, has been extremely satisfactory. Cons: I'd like to see more flexibility and robustness in the reporting functionality of the software. The out-of-the box reports aren't that useful for my needs and I'd like to be able to customize reports without having to download to Excel and manipulate data in that way. Thanks for your comments. We have forwarded them to the product management team to review as they are looking at the roadmap. BirdDogHR saves so much valuable HR time, allowing me to focus on connecting with people. Pros: BirdDogHR is so simple to learn and easy to use. Even the Hiring Managers who are not very tech-saavy love the ATS. And if there is ever a question, the Customer Service representatives always answer the phone and are willing to assist. Pros: It's practical and simple to use. As a government contractor, creating the applicant log was a breeze! Thanks for these comments. We have some ideas to share with you that will help. Your account manager will be reaching out. Pros: Good record keeping- good customer service on phone- Good response time from our account manager- conference was also helpful. Cons: There is no offer letter available online for new applicants and this is a very important feature which I know is being worked on. Thanks for your review. Offer letters are now available so your account manager will reach out to you to tell you more. Birddog HR does a great job with customer service!! Pros: I appreciate the functionality of the site that it will automatically post your jobs onto all relevant web sites. This helps save a lot of time. Cons: The only thing that I can think of is that I wish that our ad was published with some customization instead of looking like all the other Birddog HR customers. It is not a deal breaker for me though because the pros out weigh this. Overall: It saves time and helps me with my recruiting efforts. Thanks for your comments and feedback. Your account manager will reach out with some ideas for you about how you can extend your employer brand. Pros: Many aspect of the software can easily be customized to company needs, instant updating to website, easy organization, makes job posting a breeze with one-click posting to multiple sites. They have reports available for any tracking and reporting purposes. Their customer service and training is very hands on they are always there when you need them. All the employees I have worked with to get the system up and running have been exceptional! Cons: Wish there were a few more ways to "hard code" or customize things based on our needs, but overall they are minor things. 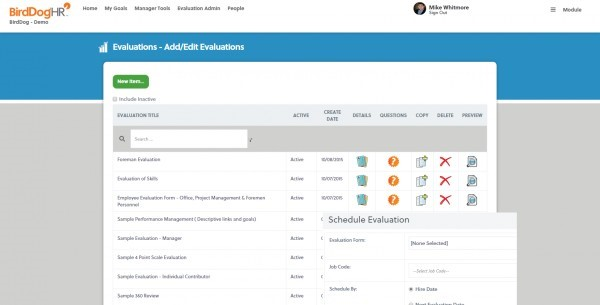 Overall: Has made my job a LOT easier with a ton of their features: one-click job postings to multiple sites, streamlined applications, automatic tracking, ability to send emails directly from the ATS, ability to link with calendars, audit trail of communications and documents, templates for emails and job postings, etc. Pros: This is a good product for the price, it has lots of features and is user friendly. The added integration of free job boards was one of the main reasons we selected the product and have had good results so far. Customer service is usually very fast and helpful. Cons: Not enough customization when needed. There are many times when we need a small process changed or need another option for our users but they are unable to accommodate. The dashboard and custom reporting need more work to be fully functional and customizable, errors pop up frequently or results are returned incorrectly. Thanks for the great review. We are glad the BirdDogHR ATS is meeting your needs. While the software isn¿t customizable because it¿s on a SaaS platform, we¿ll have your account manager reach out to see if there are additional configurations that will better match your processes. Great product, better customer service. Pros: Easy to use platform, aesthetically pleasing. Customer service is by far the best in the business. They are attentive and take may needs, questions and concerns seriously. Cons: Has so many features of an HRIS. Adding info about benefits and time off (PTO) management would be great. It has helped us find good candidates for the job. Pros: It is relatively easy to post jobs and get the applicants. We have had good response in most of our locations. Cons: It is complicated to bring other users and get attached to our websites so the jobs post there also. Overall: Finding candidates for our jobs. Thanks for your comments. Your account manager will reach out to share some ideas that can help, We appreciate your feedback. Pros: BirdDog HR is an outstanding product. Easy to use, great customer support, all around wonderful product. Cons: I would like to see more sorting features and reporting options. The good thing is, BirdDog HR is always listening to their customers and constantly installing updates, keeping their customers informed as well. Pros: We are so pleased that we have joined forces with BirdDog to fill our employment needs that we have eliminated all other forms of employment except for referrals. This product has enabled us to manage applicants more efficiently and to collaborate on each applicant if necessary. Cons: There are so many attributes to this product that it is hard to pinpoint a "least like" that would be a significant deterrent to using this product. The vendor has made suggestions when necessary to minimize or eliminate functions that were less than perfect. Again, we have a great customer service representative, which helps cure all ills. Recommendations to other buyers: Talk to others who use the product. Make a list of the tasks you perform currently when trying to fill a position for comparison with this product. Upon complete comparison, examine whether the tasks the product offers exceed your current tasks, and for those not done by the software, examine the necessity of performing such a task. Pros: The best thing about this product is how easy it is to use and the customer service behind it when questions arise. It has been obvious that BirdDog HR takes pride in its product and the services it provides, from installation to maintenance and the overall training for the customer. Cons: While the posting to multiple job sites is an excellent feature it does not allow you to individually sponsor the jobs to keep them at the top of the job board (for example on indeed). The jobs can get pushed to the bottom of the job boards fairly quickly (depending on how many other positions like yours are being posted at the time) and can make recruiting for large numbers of applicants difficult. You may have to find alternative ways to recruit. 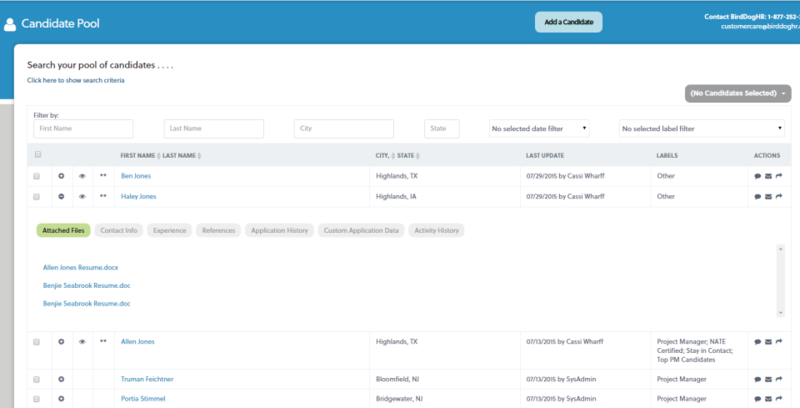 Recommendations to other buyers: This is a wonderful tool for organizing and keeping up to date records of candidates. It is a great way to track all the candidates and allows you to quickly pull up past or present applications when candidates call to inquire on their status. I would highly recommend this product for how user friendly it is, how easy it is to learn, and above the support you get when issues do arise. 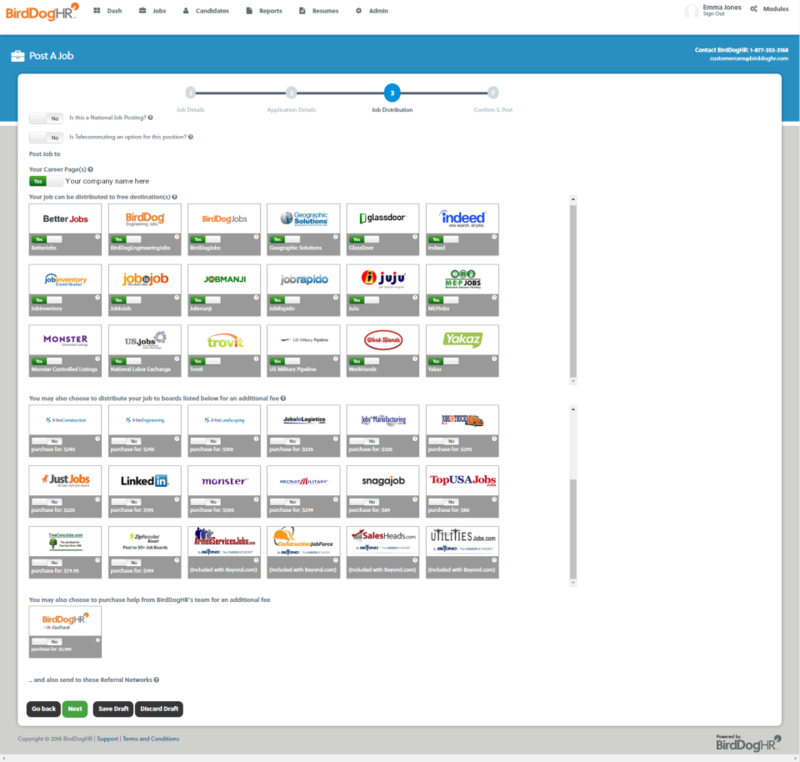 Pros: Great to have all candidates in one place to manage applicants, keep documents and manage stages of hiring process. I am a one person HR department so Birddog really helps me with recruiting efforts . it is a great solution for me. Cons: I don't really have any criticism of the Birddog HR software. It is a great tool and solution for me. Overall: Saves me time and keeps me organized when we are recruiting for employees. Get To Know Your People! Pros: BirdDogHR has been a huge tool for us to really get to know our people closer. If you don't take care of your people they won't take care of your organization. This platform helps track everything you need to increase employee retention! Cons: This really requires a team effort to load data into, which is not a bad thing. It is another opportunity to really get to know who is in your organization if you are separated from the front line! BirdDog does what we need it to do - and is an easy to use interface for our employees. Pros: Simplicity of use - it is powerful enough to do what we need yet easy enough for our users to learn quickly. Cons: Updating forms in reviews can be clunky - trying to move around data fields by moving one space/position at a time could be easier. Thanks for your review. We appreciate your feedback. Your account manager will reach out to see how he can help you with the forms. The system has helped us considerably in improving our applicant flow. Pros: Ease of operation. Sorry this is all I actually have to say. Having a minimum number of characters is a flaw in your survey methodology. Cons: Scrolling through too many screens to get the actual information I want. I particularly find it a con that when I try to take my valuable time to complete a survey, I am told that my answers are too concise. Don't ask me if you don't like my answer. Poor methodology. Overall: Particularly poor survey methodology to require a minimum length of response. Many survey participants will chose to abandon the process rather than embellish their answers. Comments: The experience my company has had with BirdDog has been very up and down. At first it seemed like a dream in solving our recruiting and hiring problems, and it helped get us organized. However, lately we have had troubles with it sending wrong times to candidates and hiring managers for their interviews, which makes the company and our department particularly look unprofessional and the candidates unprepared. We have had to take extra measures to ensure that everyone is on the same page resulting in a waste of company time. This was one of the main processes we were hoping this program would streamline. Not only has this been a problem, but it remains unresolved going on two months. Pros: It is very helpful in keeping all candidates to each job application separate and organized. Cons: Viewing notes is done in two places, and cannot be linked. This does not save much time as you have to click and both are on separate screens. When we voiced our concern, they told us there was no way to change this and it is the way it is. BirdDogHR is a GREAT ATS!!!!! Pros: It was so easy to use, I got a lot of great feedback from applicants as well. Cons: Nothing, this is a great product that is supported by a GREAT team! Recommendations to other buyers: None, I found it to be seamless in implementation. As always compare against others but I have been VERY happy. Comments: Overall, over the past year, my experience with BirdDog has been a positive one but you can tell that they are a young company and many of their modules are still in development while being operational at the same time. Cons: They are young company and new to the idea of converting a company from an existing LMS to their LMS. 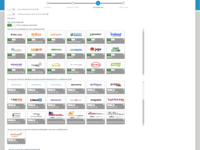 Most of their LMS customers so far are new to having a LMS. Recommendations to other buyers: Be willing to help them develop their products, be patient. 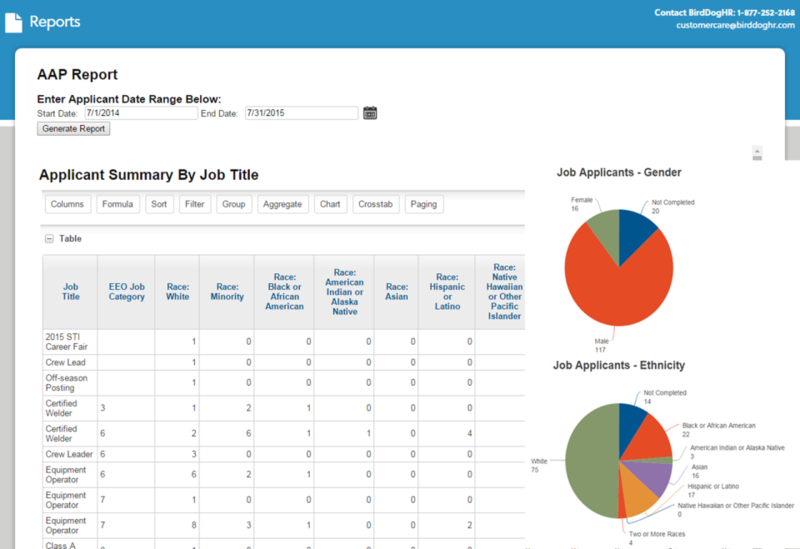 Pros: I like the ease of use, tracking of data and applicants, and reporting features. Cons: There are constant product updates (which is good that the software is continuing to develop). Although when released, there seem to be a lot of new glitches that appear. It's nothing terrible, but is just noticeable. Selecting the back button does not actually bring you back to the page you were on for all web pages. Their response time to issues is good. However, the response time to actually resolve issues is less than desirable; 3-7 business days. Recommendations to other buyers: I would like to be able to sort out the requisitions as well as the list of jobs, by date or shift or some method of categorization instead of having to sort through dozens of reqs. Comments: BirdDogHR is easy to use however it is a slow system. Good for basic use. I used bird dog daily when i filled in for our HR clerk while she was on maternity leave. Pros: I like how everything for every person is under there name and it is relatively easy to find the information that you are looking for. It was simple for me to learn how to use with only 2 days of training. Costumer service is very very quick and helpful! Cons: It is a lot of going back and forth trying to find where things are put. It can be confusing at first but once you get the hang of it it is easy. Pros: Customer Service, layout for candidate is easy with the drag and drop in your resume feature. Honestly, that's all I can say so for about the pros. Cons: No SOP to try and troubleshoot or learn features on your own; I always have to email an account rep to clarify or show me how to use a feature. Talent feature is very time consuming, as you have to load everything manually into their system and there have been several bugs and glitches. Thanks for your feedback. Your account manager will reach out to you to see what additional training we can offer to help with any areas. One stop shop for recruiting! Pros: I like how everything is at your fingertips including a tracking system of how many attempts you have made in contacting them. I also like that and you can go over a résumé and call the applicant in seconds by simply clicking a button. It's very handy and makes light work of ad call screening. Cons: I haven't run into any issues as of yet. That said, I have nothing I like the least about it, because literally everything about it makes my job of recruiting easier. Recommendations to other buyers: Time yourself and see how much time it takes you to do your screening and then try this out and do the same to see if it saves time. In this world, time is money and saving your time is everything. Great product with matching support. Pros: I like the ease of use, and the increased applicant flow. The ability to easily communicate with applicants and hiring managers is a plus. Cons: I think that the reports could process more quickly. I think that the Spanish application could be a button next to the 'Apply' button that is in English. Thanks for your feedback. We appreciate it. We have forwarded your feedback to our product management team. Pros: It is easy to use and in most cases is very intuitive and has a great layout. Cons: There are a few things that are hard to find within the software. Easier access to offer letters within a candidate profile would be appreciated. Overall: We are relatively new customers but our overall experience has been great. From our initial call to getting everything up and running to every day use, BDHR has been great to work with. Pros: It's user friendly and it takes very little time to learn the basics and be efficient in using it, reports and performance monitoring is great, also the fact that employees now can upload their information themselves is really great. Cons: From a small organization's perspective this product's functionalities has it all but pricing might make you think twice. Recruiting software that is for too difficult for others to easily use. Pros: Once a job is entered/posted, it is easy to repost it to other locations if needed. It is value priced so that is the reason my company uses it. Cons: Difficult for the site managers to use. It is a program built for recruiters - not the common manager. BirdDogHR will do updates that will mess up what you have established such as an application but you don't know until applicants say something. It is cumbersome and not at all easy to navigate. Overall: Very little. I don't like the software at all. It is too difficult and time consuming to manage. Pros: Jobs automatically posted to boards, e-mail reminders to renew listings, EEO tracking, e-mail notifications for new applicants listing name and position applied for. Cons: Candidate and Jobs sections take you to different candidate summaries, confidential EEO Information listed in summary, can't send offer letters through system, not partnered with HRIS for easy on-boarding, no e-signatures. Resume/application was not attached to e-mail notification. BirdDogHR continuously works to enhance our talent management suite and we have implemented offer letters, e-signatures and HRIS integrations into the system. Candidate summaries are permission-based to keep EEO information confidential for non-permissioned users, which is why the job section takes different users to different candidate summaries. Additionally, links to resumes and attachments can be found at the bottom of the email notification after candidates submit their application. Look no further, this is the software you need! Pros: Our applicants went from a 45 minute application process to 5 minutes. We are seeing more traffic than we ever had, so that is encouraging. The tool is so easy to use, but if you have any questions or concerns at all, BirdDog is only an email or a phone call away and the responsiveness and friendliness of their team is outstanding. Cons: There is really not much I don't like and I've provided input on a few convenience items which they have taken note and hope to put in a future release. Recommendations to other buyers: If you compare applicant tracking software, there are all going to have pretty similar functions but what sold us on BirdDog is the support after the sale and the ease of use of their software. Another reason is future add-on products such as their on boarding and performance management piece. It's a one stop shop for all your HR needs. Pros: BirdDog has invested a great deal of attention and resources into their system over the last couple years, transforming the site. The staff is a knowledgeable group and very attentive to customer needs. 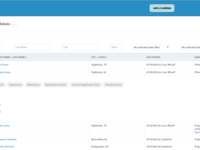 I like the ability to track applicant data, the ease with which it syncs with our website, and the ability to advertise and produce compliance reports. Cons: BirdDog has been very helpful addressing all my requests for improvements. Recommendations to other buyers: The BirdDog system is customizable to fit the needs for the "mom and pop" shop or the 1,000+ employee federal contractor. Explore all of the options BirdDog provides. Pros: I like the ease of use. It's a time saver and one stop for all our employment needs. Their people are friendly, knowledgeable, and readily available We can train users at different locations with very little time and effort. We also have the option to expand our outreach for a new position when needed. Cons: Sometimes, a few of our users complain about the system being slow. This often is a local problem with the IT system they are using.